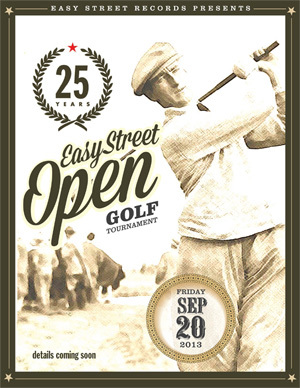 Benefiting the West Seattle Food Bank, Easy Street Records is holding their first annual Easy Street Open Tournament this Friday, September 20th at the West Seattle Golf Course. It’s a four man scramble where you can create your own team or Easy Street can help you find one. When: September 20th, Check in at 9am, tee-time at 10am. Where: West Seattle Golf Course at 4470 35th Ave SW.
How: $75 fee for one player and includes afters hours party with food, beverages and entertainment. Entry Deadline is tomorrow, September 18th. For more details on how to enter please visit the Easy Street website. Easy Street Records is located at the heart of the West Seattle Junction at 4559 California Ave SW.